And these become of him or her that peruses them now. The experiences become ours, as the reader, through our taking them in as the poem’s meaning. The child is the poet, is the ‘child’ written on the page, is each of us, is me. It has happened without our being told it is happening. That’s what language allows! I find myself in you through something universal. In this essay I want to touch on the way our speaking, our conversation, can so easily turn us into ‘talking heads’, can disturb beautifully co-ordinated poise in a moment of tense verbal response – and yet, conversely, the refinement and depth of speech can fill and colour our individuality. It can animate us right down to our toes and reach out to the person we are speaking to, creating a space of communication as spiritual as it is physical. There are many ways in which we can be absent and present in our speaking, in this most delicate and strangely unthinking employment of our muscles. It is important, in the context of the Alexander Technique, to remember that the movement audible in speech, is able to be transformed into, other kinds of movements, gestures, signs, but, in speech, our moving is shaping the air flow of breathing, through the larynx, throat and mouth. Speech comes to life in us, and then we as individuals come to life through speech. This is the sounding through, the per-sona of our personality. As the young child’s speech develops, the different possibilities of speech are manifested – expressing my wishes and feelings, naming the things and beings of the world, allowing me to understand and reach another person. Speaking cannot be without some kind of listening. Once the child is standing upright there is a separation of the child from the world out there. Language helps to establish the child at the centre of a world. The awakening of speech, as the typical two-year-old becomes more fluently mobile – running, jumping, climbing – are developments which show the same spirit of discovery, and out of the gradual development of poise and fluidity of movement, of confidence, comes the acrobatics of grammar, and a joining into the social world. The child learns to talk, to converse, to live in the give and take of social breathing. Out of the creative liveliness of language the wonderful structuring of grammar brings into the child’s life the experience of time, space, number, psychological subtlety. The possibility of thinking awakens through the child’s use of language in connection with the developing memory and the power of play, movement, imagination. These last elements are so important because they keep the internal world of shadowy abstraction in touch with the physical, with colour, and spontaneous joy. We need our limbs to be energised in order to discover thinking. But thinking, too, cannot do without listening, including a listening to oneself. And this has in it the stilling of movement, and the beginning both of self-awareness, of the sense of an ‘I’, and of the wish to connect more fully, out of the child’s own desires and impulses, with the world she is waking up in. Thinking brings with it both an awesome sense of a separate individuality, something before learning and beyond instinct, and of that individuality disappearing into the active, demanding, frustrating business of growing up into a personality. Another way to understand the genesis of thinking is to see two streams meeting in the child’s development. One is the child coming into her body, elaborating and controlling movement: the child stands, walks and, in the end, speaks. The other stream is to do with experiencing the world through sensory discrimination, and through this stream the child finds her way into language via listening. Speaking meets language, and thinking is born. The question I want to arrive at is one to do with inner voice, with listening to yourself, and how hearing our own speaking intertwines with – a subtle idea – speaking what you hear another person saying. Entering the world of another, and the impulse to share our own world with others – these two things go together just as do the obviously motor, movement, side of speaking and the sensory side of listening. We do listen to our own voice but not, I think, in the same way that we listen to the voice of another person. My ideas here are based on my experience and intuition and a certain familiarity with relevant research. You may remember the broadcaster John Diamond who did carry on broadcasting after losing his familiar voice to throat cancer. He would be aware of his old voice as he was about to speak with his distorted, ‘artificial’ post-operative voice: “In the milliseconds before I spoke I would hear the words in my head, sounding quite normal, very John Diamond, and I’d open my mouth to say them and what would come out would be somebody doing that honking impression of Charles Laughton”. I believe below this superficial level of inner voice is a deeper one in which words as such die into thinking, a level in which, unconsciously, I live in the structuring of my own speech, both listening and producing. This level of self-presence, I believe, belongs to all intentional movement, most intensely, language. It is what makes empathy possible, and not just the interpretation of behaviour, mine or someone else’s. My own unconscious inner monitoring lets me find my way to the meaning which is being expressed by the other person, and then back to my own meaning making. True, I often don’t know what I think until I hear what I’ve spoken but underneath the public recognition is a plumbing of my depths which is prior to my going public. I want to bring in now those experiments and insights about memory which we have come to label ‘false memory’, and which are often associated with remembered, or imagined, abuse as a child. The basic import of such experiments was that it is amazingly easy to create a state of being in someone so that they are convinced something happened in the past which didn’t happen. The classic experiment is that by Elizabeth Loftus in which people came to believe they had once, as a child, been lost in a shopping mall. The subjects not only came to believe in the incident, but added loads of new narrative detail to the story. What this experiment tells me is about our need to create stories to cope with pain, and that means – with life. This story telling, in the experiments, came out of fictions provided by trusted family memories, and for me demonstrate that the story-telling need of the individual is a basic self-healing impulse. Sometimes trauma will be unknown, or be expressed only through physical pain or muscular tension, but the speaking of the pain, the turning it into story, is important for trauma that has been forgotten, trauma that cannot be forgotten, and trauma which is accepted on trust. Language helps us to take personal responsibility for pain. When regrets become fiction, become language, we are doing justice to our deep self. So I don’t like to speak of ‘a false memory’ or of memories being ‘implanted’ or ‘distorted’. We bring the stories forth to deal with pain, and perhaps that story-telling lives in other movements, everyday movements, playful or dance movements. In work such as the Alexander Technique, while we value a certain simplicity and abstract quality in the movements we employ to encourage freedom of use, I think it is helpful to keep an element of fantasy, of story-telling in the action, and to quietly acknowledge language as a way of opening up and exploring those deep domains in which the structure of our self, the way we move, the story we tell of ourselves, abide. There is a story (true-life) of an autistic girl, Isabel, told by her father Roy Richard Grinker in a book called Unstrange Minds: Remapping the World of Autism. Aged 5, Isabel came to know a story book about a girl who travels to visit Claude Monet’s house and garden at Giverny. This story changes Isabel’s life and leads her into totally unexpected possibilities of social interaction. She learns the book off by heart, she absorbs the video of an animated version. 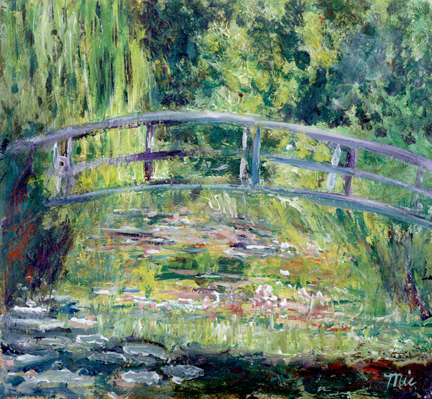 Then her parents, who live in Washington DC, take her to see one of Monet’s paintings of the pond and Japanese bridge and, eventually, to France, to the garden itself where, more calm than she had ever been before, she stood at the highest point of the bridge for an hour. Isabel began to learn French, with her parents’ help, in a way that she had never managed with English. She enjoyed the artificial, structured learning. She enjoyed, through the whole procession from book to video to painting to garden, the challenge of the layering of reality. The story had drawn her in and she had begun to play, to connect. Now, I think it is worthwhile to dwell a little at Giverny, the house and garden to which Monet moved, aged 50, in 1890 and in which he lived for the next thirty-six years becoming more and more of a recluse. These are the years during which Monet slowly progresses to the huge paintings of water lilies, ‘landscapes of water’ as he called them in which the flat surface of the picture represents the flat surface of the water in which the lilies rest and in which the three-dimensional world is reflected. Here we play between illusion and reality, as we do also in Monet’s technique. Paul Cézanne said of Monet – “he has muscles” and that physical presence of the painter’s hand and dedicated attention is there, despite all talk of delicacy and transience. You see the painter’s work, the paint applied and you see the natural world that is being created for you. You see both but you do not confuse the two. Contrast this with all those beautiful mirror-like landscapes from Dutch seventeenth century art where the purity of the artist’s thinking vision means the hand has disappeared: we are left caught in the magic of mirage. With Monet, like little Isabel, we stand on the famous bridge and can move between the two sides – what is painting and what is nature. For the young child developing, in particular, it is so important that there is easy, unconscious passage across the bridge of the life-processes which connect body and soul, the physical and the emotional/intellectual life of the child. I find it so imaginatively appropriate that the isolated Isabel finds her way to the mid-point of the bridge in the garden, where she was able to take in the textures of reality – and find her story. Monet destroyed hundreds of his water-lily paintings during the more than thirty years in which he was experimenting, often slashed with a knife. Some were exhibited quite early on, in 1909, and Monet spoke at the time of their essence being in his “total self-surrender. I applied paint to those canvases the same way that monks of old illuminated their books of hours; these owe everything to the collaboration of solitude and passion, to an earnest, exclusive attention bordering on hypnosis”. The critic within whose essay these words are found, writes that “the magical evocation of the reflection supplements the evidence of reality; it is these reflections that evoke the vanished shores” and of Monet as “the painter of air and light… of shafts of light displaced by the earth as it turns” (Roger Marx, Gazette des Beaux-Arts, June 1909). With language we are always living with different levels, with metaphor, with one thing being like another but not the same. It is this which allows us to go down and into ourselves, to our body, and to go out to the minds and hearts of other beings, other things. We can reach out to the vanished shores of a wider, cosmic existence in which we were once integrated, and sense the hard earth turning under our feet. Isabel on the bridge has distance from each side, and distance from the reflection. Out of the distance can come contact, can come bridging, because contact is always rhythmical and mobile. And language, of some kind, is necessary both to know ourselves and to find distance: distance and depth. I want to end with a quiet, unpretentious poem which tells me something profound about the everyday discipline of using story-telling to cope with pain, a discipline which is self-questioning, aware, yet spontaneous and open – the qualities which Monet cultivated in himself and which for him meant his paintings stayed in the world, stayed true to nature, even as they conveyed “an idea of infinity” and “the instability of the universe”. He is adamant that it is not the case that his works “simply leads to a fairyland” (quotes from article previously mentioned). wait for a stray bird. letting go can also mean love. and wait for the stray bird. This poem speaks my meaning – the storytelling that treats our pain but stays attentive to the detail of experience, that moves on but remembers, that knows tapestries belong with footprints, but are different.